I wanted to head east for a snow scramble. I managed to wrangle Jim, Tom and of course Jasper into joining me. I've been to the Red Top Lookout before but the conditions were drastically different. We were able to drive to the TH which is just a short 1/2 mile "walk" to the lookout. This time our journey would be much longer. We drove the ~ 2hr drive from the west side to Mineral Springs off Highway 97 before Blewett Pass, parking in the Mineral Springs Resort parking lot (as far from the customer parking as we could get). We knew the snow cover would be thin, it was a weird Winter for snow, but we were confident there would be enough to make the trip worthwhile. We'd brought snowshoes, microspikes, ice axes, and lots of warm clothing. When we left the parking lot it was early, just after 8am, and boy was it cold. We crossed the road and entered the campground, completely covered in snow. Then we spent a bit of time double checking maps and GPS to find the road up Medicine Creek. The snow was compacted enough that there was not need yet for the snowshoes. We followed the road west up Medicine Creek and about 1.4 miles from the car, we left the road just before the road does a sharp switchback and heads back east toward Pt3543. Leaving the road, we headed up the ridge, southwest, towards Pt4035. The snow was hard and somewhat icy and slick under the tree cover. From Pt4035 we headed west again following the ridge to the head of Medicine Creek. At about 4200' we stopped to put snowshoes on, finally tired of post holing in the now softer snow. The ridge is pretty mild, lots of ups and down but nothing ever really steep or narrow. After one short steep area, the ridge drops sharply to an old logging road. The snow cover here was on the thin side so we chose to head down the nose of the ridge instead of dropping down the side. A bit of a right at the bottom brought us into a clearcut area where we caught some views of the lookout, still a ways away. Eventually, near the head of Medicine Creek, we cross over the main road that heads up from Hwy 97, the road that in the summer you can drive to within a 1/2 mile of the lookout. At this point we were about 4.2mi from the parking lot. Felt strange in a way to have walked what doesn't take long to drive when the road is clear of snow. We connected with the main road at the sharp switchback where the road stops going south and turns and heads back north, nearly following the crest of Teanaway Ridge. From hear, we followed a snowmobile groomed road most of the rest of the way to the lookout. The road was nice to follow with some ups and downs but nothing really all that steep. Thankfully, we got lucky and managed to avoid most of the snowmobiles for the better part of the day. In fact, we didn't see machines until just below the lookout. I found the last bit up to the lookout a bit "tedious" as I was still getting my snow legs back. Just below the lookout, in the open, the wind was blowing pretty hard and the cold was biting. We found a bit of shelter behind a small shed and it was time for a quick lunch break. I recall that most, if not all of us, brought warm liquids which really helped keep the temps at bay. We got to the lookout about 12:30 (4h20m from the car). We could tell from the increasing winds and dark clouds approaching that weather was moving in so we kept our lunch break time short. By 1pm we had packed back up and were heading back down. We followed our tracks back down nearly all the way to the car. We were back to the car by about 4:15pm just squeaking in the end of the trip before it got dark. 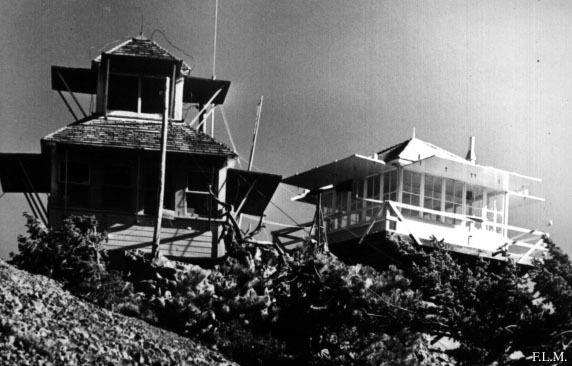 More information on the lookout: The site was first developed with a cabin in 1924. This cabin was replaced in 1928 with a cupola cabin. The current l-4 cab on a 10' treated timber tower was built in 1952 (was abandoned from the 70's to the mid 90's but was then restored from 1996-1997. It is currently staffed as an interpretive site during the summer.